What are the critical trends in Colorado's food, fiber and green production? Will labor, water or cash be the factor that limits agriculture’s success in the next few years? What role do rural communities play in agriculture's future? Colorado State University is spearheading an effort to discuss, define and consider the potential paths that Agriculture may take in the next generation. We need your help to highlight the important issues and offer your vision of what lies ahead. Extension specialists with the Department of Agriculture and Resource Economics will facilitate the discussion both out in the state and on the internet. Agricultural sectors are listed on the right-hand side of this web page. Take a look at the agricultural sectors and their respective issues, read the opinion of others, and post your own comments. You can also email comments and suggestions for discussions to futureofcoloradoag@gmail.com . In the last decade greater public concern regarding obesity, diet, and nutrition issues has led the USDA to adapt dietary recommendations to include more fresh produce. Consumers have responded: U.S. per capita consumption of fresh vegetables and melons grew steadily between 1979 and 2007 for a total gain of 54.6%. This increase in consumption occurred during a time that the same USDA study reported prices for a representative fresh vegetable selection increased 292% (or 190% in real dollars). For Colorado, this translates to total demand of over $2.6 billion for fresh fruits and vegetables, and although many of these products cannot be grown (or available year round), even a share of these sales would represent a significant part of the state's agriculture and growth in the $310 million currently sold in Colorado. At the same time, the way some consumers shop for fresh produce is changing. In recent years, a small segment of consumers have shown increased interest in foods produced in their local community. This has been motivated by a variety of issues including support for local farmers and economies, concern about food miles and perceptions of improved quality These individuals and households interested in supporting local farmers are also fueling changes in the food system as they seek to purchase their produce via direct marketing channels rather than traditional supermarket sales. As one example, the number of farmers markets has grown significantly across the US (from 1,755 in 1994 to 4,685 in 2008) the growth is even greater in Colorado. In Colorado, producers currently sell about 5% of their fruits and vegetables directly to consumers (far greater than the 0.4% nationwide), and this number is as great as 50% in Boulder county. But, CSU studies suggest that the demand for local fruits and vegetables could be as much as 10 times greater, if supplies were available. So, some of the new Farm Bill programs targeting the development of specialty crop enterprises could be at an opportune time. Are there opportunities for existing farms, with existing family and employees, or in partnership with beginning and young farmers to transition more production to fruits and vegetables? Marketing them direct? What are the tradeoffs between land, water and labor resources for fresh produce enterprises relative to field crops? Is Colorado's climate and agronomic base a good fit for more fruit and vegetable production? What technical resources would be needed if these markets offer sufficient opportunities for current farms to consider? A 2001 U.S. study estimated that consumers spent nearly $40.7 billion on garden-related products, up 12.1% from $36.3 billion in 2000, with the average U.S. household spending $444 on lawn and garden goods. Colorado household and business expenditures on a broader set of garden, landscape and lawn products and services (including linkage industries such as irrigation systems, botanical gardens, lawn and garden equipment and maintenance services) have followed a similar trajectory, averaging almost 10% annual growth since 1993, for a 2007 total of $1.8 billion. Through 2007, the green industry in Colorado has seen sustained growth: the $1.8 billion directly contributed increases to $3.3 billion when you consider its impact on broader economic activity and employment generation in the Colorado economy. Because of its labor intensity, the local impact of this industry is fairly strong. The green industry provides over 35,000 jobs, an increase of 12,000 jobs since 1994 (tripling in size in less than 15 years), with $1.2 billion in payroll (up $750 million from 1994). These increases are indicative of the demand for green services and the ability to hire workers on a more year-round basis (resulting in greater earnings per worker). The average wage earned has also increased to an average of $35,318 annually, up from $26,159 in 2001. The industry has come along way in providing better compensation to its workers, but like other sectors of agriculture, has struggled to find enough workers. The highest growth sectors within the Green Industry during the 1990’s and early 2000’s were wholesale nursery, tree and sod production, landscape design, installation and maintenance, public and private golf courses, and nursery/garden centers. Given its need for land, water and workers, many view the green industry as a competitor to food-based agriculture, while others note that the growth in Green industries signals yet another changing preference of consumers for aesthetic surroundings. How can the green and traditional ag industries work together to benefit resource issues (water, labor) they are both struggling with? Are Green Industry stakeholders at more risk of a downturn during tough economic times? Or will those who would have normally changed homes likely to reinvest in upgrading their current landscape and add more value and sweat equity to their homes? Wheat is ranked as the third most important field crop in Colorado behind hay and corn. 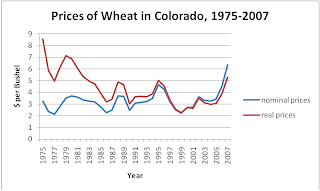 Wheat yields in Colorado have remained reasonably consistent over time, ranging from an average 20 to 40 bushels per acre, which is somewhat below the US average (ERS, 2005). The wheat industry has long been an export oriented sector, with about 55 percent of the crop being sold overseas on average since 1975. The industry is also facing challenges as consumer change tastes and as other competitors become significant worldwide, and as farm policy progressively limits payments to the major commodity producers over time. The proportion of CRP acres that return to wheat production. In Colorado, expiring CRP contracts mean that more than 1.1 million acres may be planted to wheat in 2009 and 2010. What do increasing petroleum and natural gas prices mean for wheat cost of production? Will irrigated wheat out compete corn for irrigated acres in Colorado? Will private capital be invested in improving wheat varieties? In contrast to the US, the Colorado dairy herd is increasing. In fact, the total number of milking cows in the state has grown from about 75,000 cows in 1975 to 120,000 in 2008, which is a 1.4 percent annual growth rate. However, the rate appeared to accelerate after 1990, when the dairy herd grew at about 4.1 percent, suggesting at doubling of the cow herd in about 17 years. Continued urbanization of Colorado's Front Range that converts agricultural land to housing developments. A shortage of qualified labor. Costly regulations surrounding air quality and ammonia emissions. 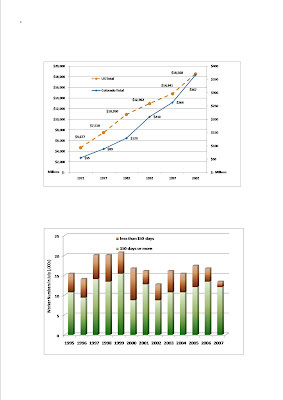 The growth of the biofuels industry. What issues are the most critical? A recent article in the Journal of Extension, "Layered Community Support for Sustainable Dairy Farming" outlines environmental, community, and economic sustainability issues related to dairy production. In a Pennsylvania survey, they found that grazing dairies are positively viewed, and nearly 70% of respondents are willing to pay a $0.50 premium for milk from grazed cows. Most respondents indicate strong support for dairy farm sustainability, especially when compared with industrial development. There was overwhelming support for dairy farm sustainability in the study region. Dairy farming was seen as being highly important to local economies. This finding, among the strongest in the study, was linked to the positive impact of dairying on employment needs of local dairy farms and the perceived benefit of dairying to the community work ethic. At the same time, low profits were recognized as a compelling issue mediating against small dairy farm survival. Vistas of cows grazing, crops growing, farm land, and freshly mowed fields were highly valued. Such core visual values associated with the green and open spaces of productive dairy agriculture cannot be underestimated in the Susquehanna watershed region. Dairy farm amenities were particularly valued near housing developments. The key to large dairy sustainability was advanced pollution control technology. Three of five respondents would welcome a 500-cow dairy in their community if manure runoff and odors were well controlled. Grazing dairies were far more positively viewed than large confinement farms. Agricultural land preservation policies for poor quality soil farms practicing grazing or organic farming was supported by four of five respondents. For the US, labor is the agricultural sector’s third largest production expense (considering all cash and noncash expenses) trailing only feed and capital depreciation. For 2008, wages paid to hired farmworkers are forecast to be $27.3 billion, and the share of workers classified as hired has increased significantly. After declining for decades, labor’s share of US farm expenses began increasing in the mid-1980s. Growers who specialize in vegetable, fruit, tree nut, or horticultural production, for whom labor costs total 30-40 percent of cash expenses, are especially sensitive to fluctuations in the cost and availability of labor, and are likely the largest employees of hired workers. The first figure above shows that the US and Colorado have followed a fairly similar trajectory, but Colorado’s expenditures have increased more rapidly than the national average in more recent years. These trends can be disaggregated in several ways to provide more information about the dynamics of labor usage. The number of workers (Figure 2 above) have seen significant variability in the prime growing season, fluctuating between 13,000 and 20,000 workers, with no clear pattern between the number employed more continuously (over 150 days in a year) and those hired for shorter terms. No year-round numbers are available, but July should represent a typical month without peak employment (like planting or harvest) and with some demand for seasonal work. Demanding fewer workers while paying more for those selected? Diversifying and adapting their production systems to use workers over a longer period of employment? Facing shortages that impact their ability to produce, harvest or choose specific crops? In the West, the economic sustainability of farms is tightly woven with water availability. For these farms, irrigation is an important risk reducing input that shelters farm income from drought and boosts crop yields. In addition, irrigation permits farms to produce crops (e.g., corn, alfalfa, onions, sugar beets) that otherwise could not be grown competitively in our semi-arid environment. As irrigation was developed in the West, farms generated important economic activity for rural communities and regional economies. Irrigated agriculture is a primary water user in the West, but rapid population growth is driving a reallocation of water use. Colorado’s population is projected to increase by roughly 2.8 million residents between the years 2000 and 2030--an increase of about 65 percent. The Arkansas and South Platte Basins, which are already the most highly-populated basins, are projected to receive the most new residents. By the year 2030, the Arkansas and South Platte basins will be home to a combined total of almost 2.4 million additional residents, bringing the total population in these two basins to over 6 million people, making up more than 86 percent of Colorado’s total projected population. Where will new population find municipal water? Many policymakers agree that voluntary sales of water from farms to cities will be an important source. The Colorado Water Conservation Board's Statewide Water Supply Initiative (2004) predicts the following dry-up of irrigated acres as a result of voluntary water transfers. What impact do you think this will have on irrigated agriculture? What policies might be considered, if any, to help rural and urban water users share resources?